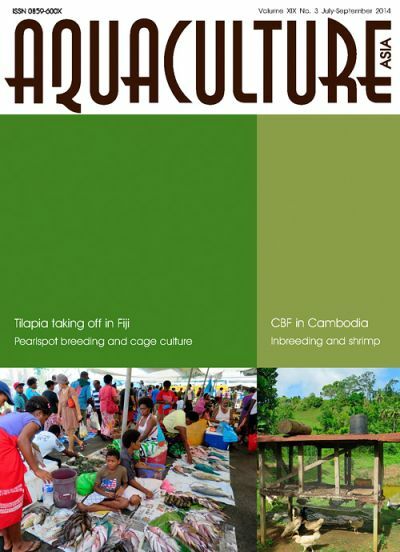 Peter Edwards writes on rural aquaculture: Commercial tilapia farming at 'take-off' point in Fiji. Tank based captive breeding and seed production of the pearlspot (Etroplus suratensis). Biswas, G., Sundaray, J.K., Ghoshal, T.K., Natarajan, M., Thirunavukkarasu, A.R., Kailasam, M. and Ponniah, A.G.
Cage culture of the native cichlid, Etroplus suratensis (pearlspot) in Kerala, India; A laudable initiative towards emergence of small scale cage culture. Culture-based fisheries exchange visit from Lao to Cambodia. WAS Adelaide: Special Session on Regional Cooperation for Improved Biosecurity. 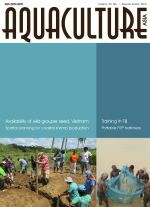 Inbreeding and disease in tropical shrimp aquaculture: A reappraisal and caution. Shrimp EMS/AHPND Special Session at DAA9. 2nd International Symposium on Aquaculture and Fisheries Education.